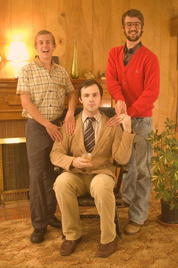 Since 2007 a couple of old roommates and I have been producing our own Christmas card. It all began in 2007 when my two roommates and I moved in together. The house we rented had a very vintage feel, 1970's vintage. We decided to take advantage of this and hold a photo shoot. 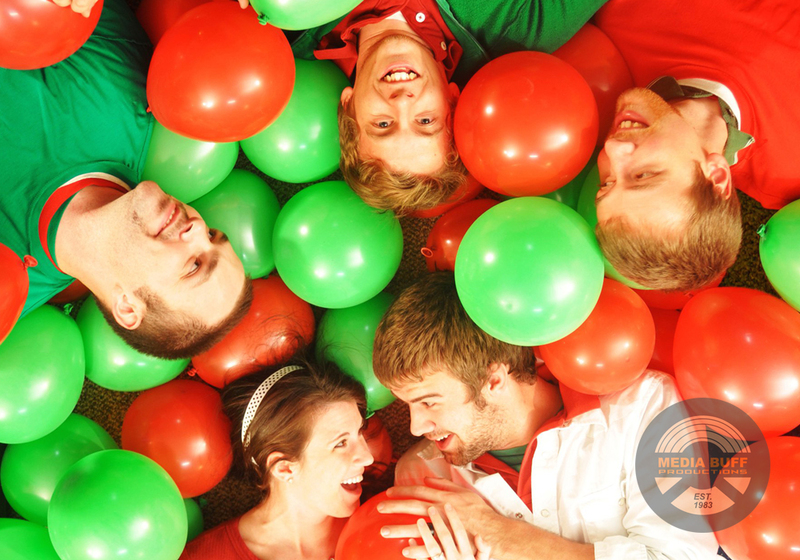 We decided we loved the photos from this shoot so much that we should use it as a "Family Christmas Card". So I took one of the images from that shoot and produced a Christmas card that we mailed to a lot of our friends and family using the name "The LaFargels" which was a combination of the three of our last names. That image is on the right. We had a roommate transition in 2008 and decided not to do a card, but by the time 2009 rolled around we decided to take another stab at it. Even though our original roommate was gone, we decided it wouldn't be the same without him. We set up a small, tacky set in our basement and took some photos! By 2010, our original roommate was married, the family was growing! So for the 2010 card we decided to include his wife. My other original roommate and myself both had significant others by 2011, but determined they would not be included in the "Family Christmas Card" unless they had married into the "family". 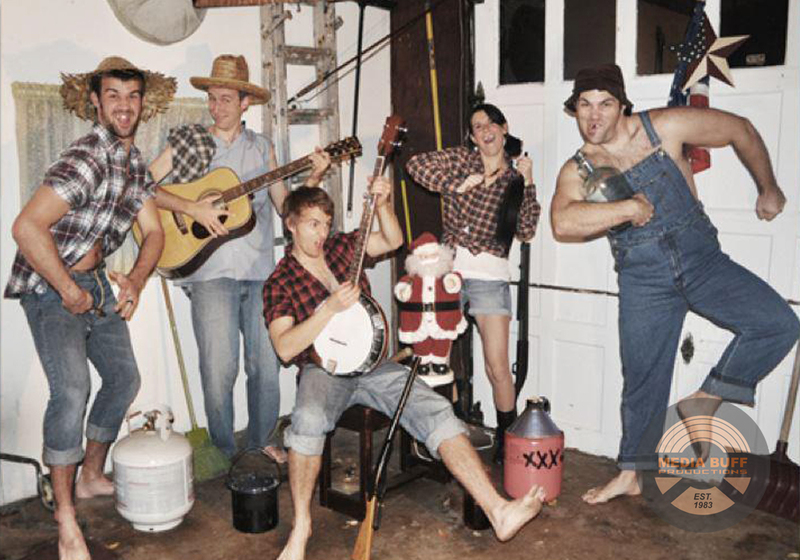 For the 2011 theme we chose "redneck". By 2012 my last original roommate was engaged, as well as my other, current roommate. So the 2012 remained the 5 of us and we went with a "Buddy the Elf" movie theme. As 2013 rolled around, my two original roommates as well as my other roommate for the past 5 years were all married. I had 2 new roommates and I was newly engaged! This created a 2013 dilemma. Should we create a Christmas card with 10 people in it that would include all the wives, my fiancée and roommates past and present? Or should we not do a card anymore until I am married? We decided that 2013 would be an off year with so much transition. In 2014 I got married, moved out of my old house and in with my wife! By the time Christmas rolled around, all of the original LaFargels men were married and we decided that we must do a card with our wives in it! So we brought the Christmas card back! It was nothing super complicated, just a little goofy scene around the Christmas tree. Each year brings different challenges and circumstances, but by 2015 we determined once again that making a Christmas card was indeed possible! So in 2015 we got a little more creative and at this point, two twin babies had been added to the LaFargels clan! With that, we decided to do a photo with us all sitting around but with some drawn elements surrounding us. For the amount of people involved (8), I think this design served us well! In 2016 when posed with the question of whether to go funny or cute, Grant put it simply "always go funny". So we crafted our 2016 card with adult pajamas and a children's book! In 2017 we went with the photo booth look since there were 8 of us! Many people thought the shots were too far away, and preferred to see our little faces closer. We posted the larger photos to Facebook. In 2018, we now have 10 individuals to fit on one photo, showing all our faces clearly is not easy. So we decided to dress up as Santa and his 9 reindeer. Check out all 10 cards below. 2007, 2009, 2010, 2011, 2012, 2014, 2015, 2016, 2017, 2018.